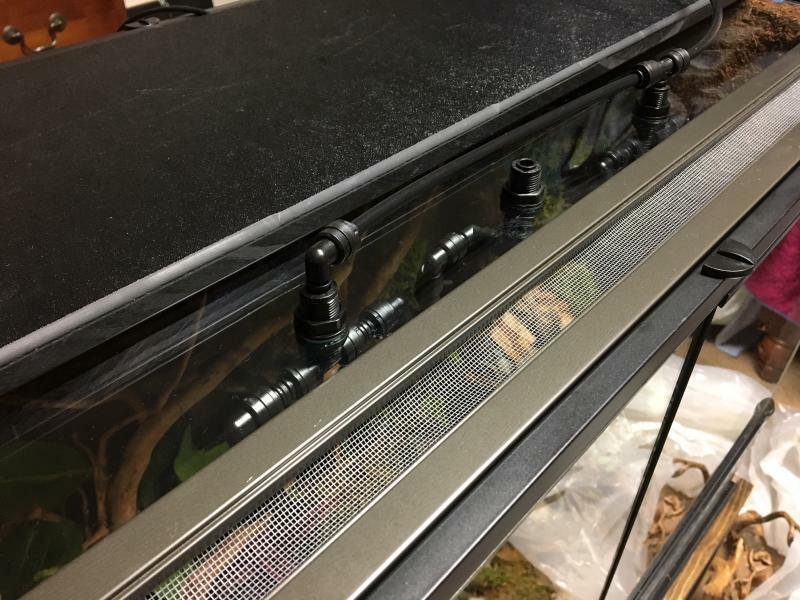 36" Exo Terra/Fairy house build. My wife loves that whole thing, and I've been wanting to do that sort of garden for her for years now, only couldn't think of how to make it work indoors. 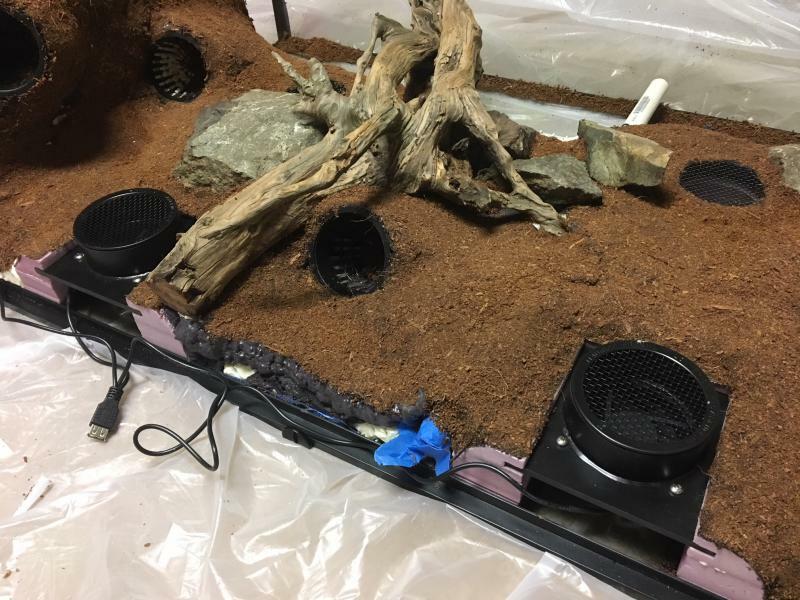 So why not combine it with a dart frog habitat? I wouldn't do this if were for me (or only for me) but she'll be tickled with this thing when she finally sees it. 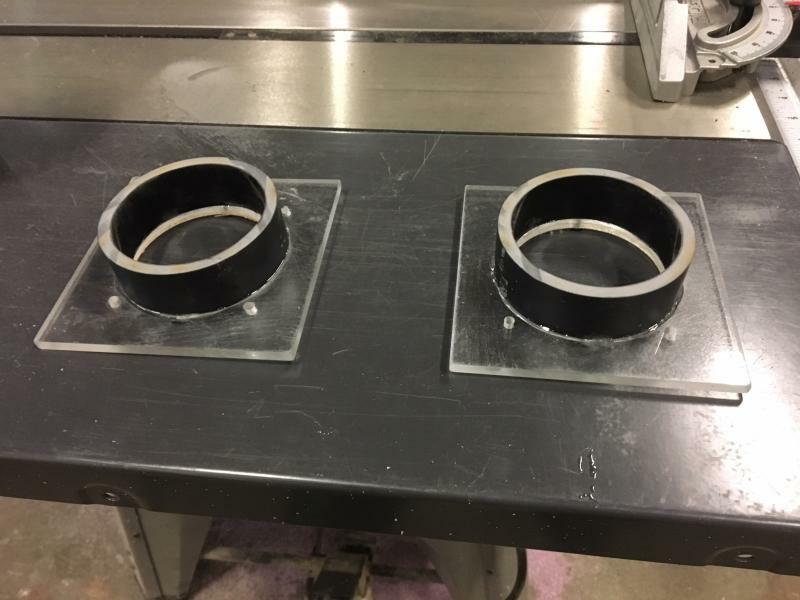 I decided to construct foam and plastic/acrylic fan insert ducts. These can be adhered to the rear glass, then carved down a bit as needed. Fans are AC Infinity - great units. 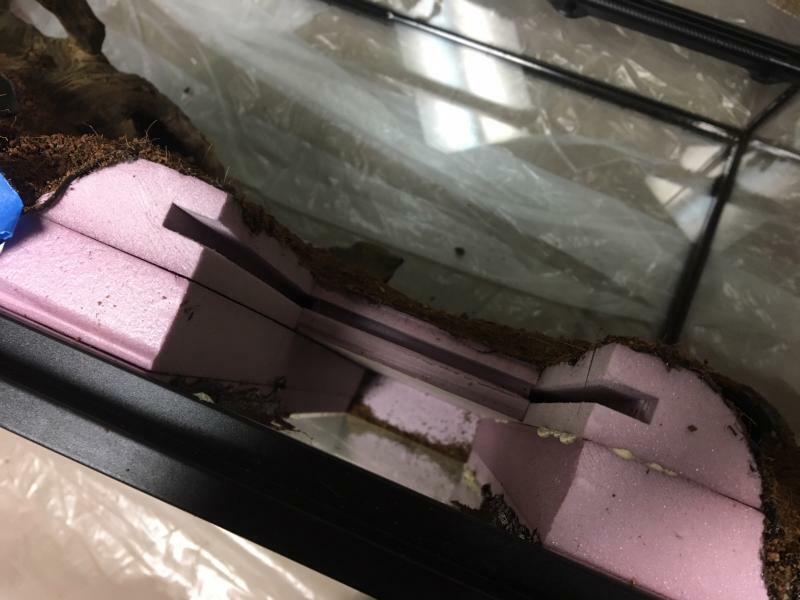 Re: 36" Exo Terra/Fairy house build. I build this from mopani wood (including the shingles) and cedar. Some of the shingles (lighter color) are cedar as well. The walls are rock and mortar over foam (sprayed into/into the piece of mopani wood) Doors is all mopani lumber. The internal fan duct idea is working out great. I can also vent the top if I decide I want to pull a bit of air in from the outside. The plants need to grow in obviously, so early days. Frogs will to in on Friday. 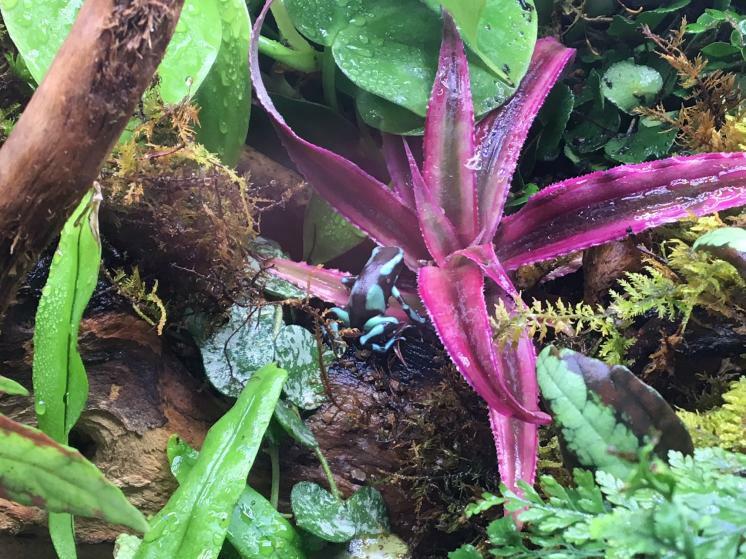 Still agonizing over auratus highland bronze or azureus. I'll have to decide on the spot Friday. 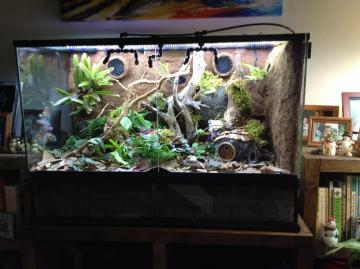 Jeremiah, Encyclia, jkdub and 5 others like this. Drilling glass was shockingly easy - about 30 seconds for each hole through 1/4" glass. 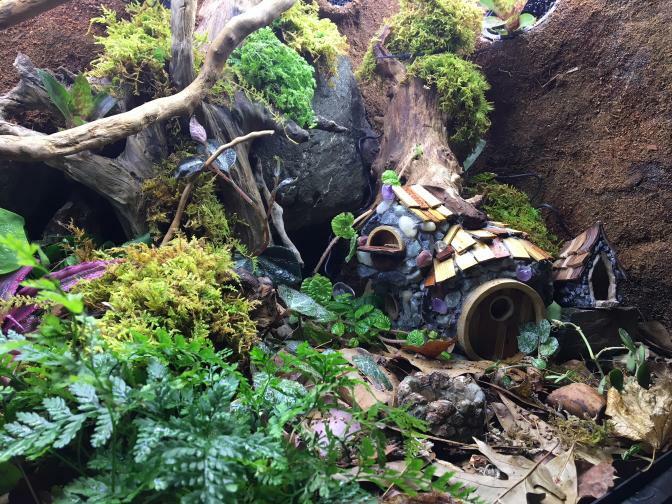 Don't tell anyone I said this, but... that little fairy house you built is awesome! This is amazing! Please tell me that the house is hollow, and the frogs can assess inside! Beautiful setup! No not hollow unfortunately...maybe the next one. 5 young Highland Bronze auratus introduced today, just a few hours ago. I already see 3 of the 5 walking around. Encyclia and Do_Gon like this. This is awesome! 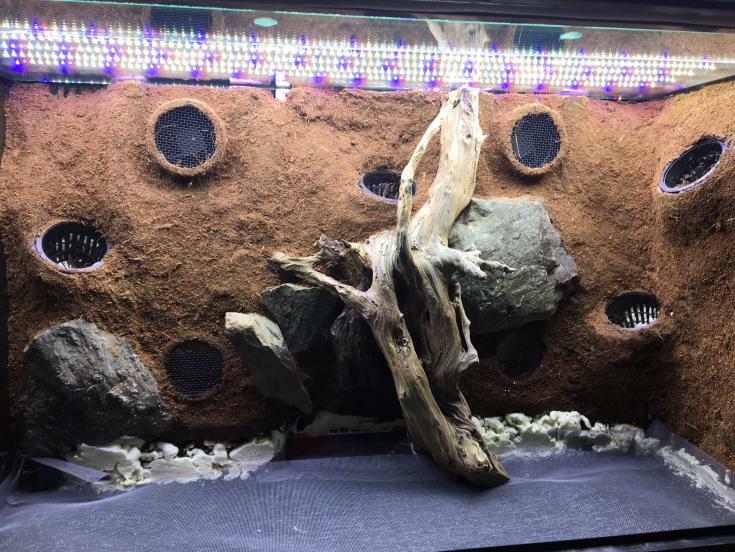 We want to make one of these for our critters. Did you give this to your wife for Christmas? How was it received? Yes, and she loves it. 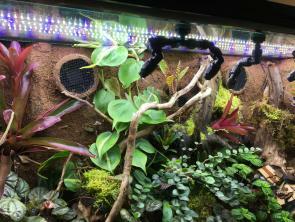 She looks every night to see how many of the 5 auratus she can see. So far one hasn't made an appearance...they vary quite a bit in their boldness right now. One of the 5 doesn't sweat you at all, and will sit there why you open the door and dump food on his head basically. Then on the other end there's the one who hasn't been seen at all I don't think. She's asking questions about breeding, tadpoles etc. Some growth, better view of fans for Camps. More pics later when the HB's are out. I'm posting 1200 pixel images, but the site seems to be down-sampling them quite a bit. Last edited by JimM; 04-09-2019 at 10:00 PM. Love this build, excellent job ! 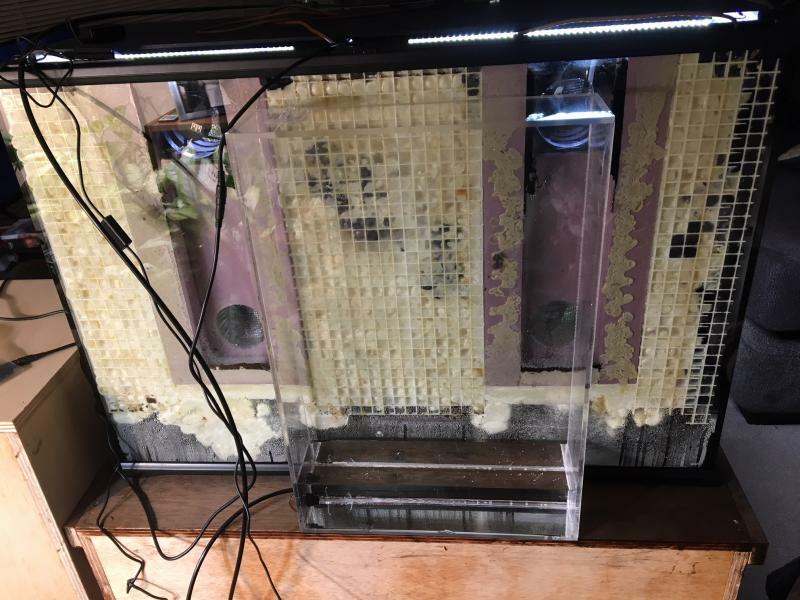 Are you able to remove fans if one fails ? ...and yes, I can simply run an X-acto blade along the edge of the pink foam/black plastic plate to break the silicone seal, and slide that plate out. 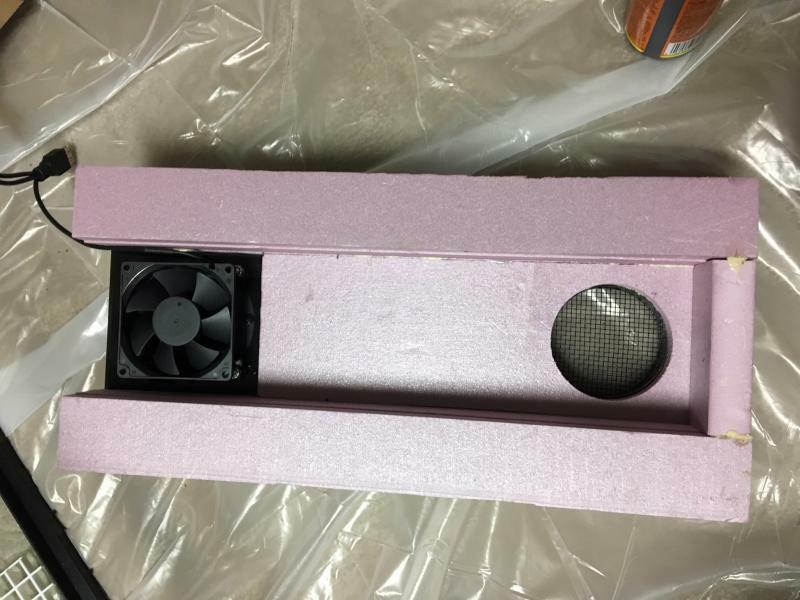 (the one that the PVC tube section and fan mounted to it. 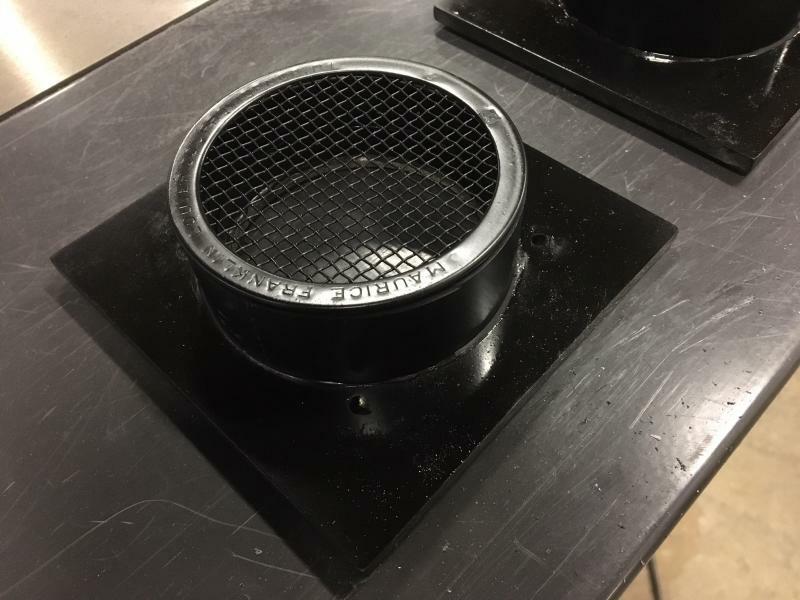 Replace the fan, and insert the plate back into it's slot. Thanks - I absolutely hope you try it - working out great.